As the only clay, white clay is hypoallergenic and yet equally effective. Helps thoroughly clean the deeply clogged, dirt and greasy pores and prevent them from returning. Green French clay is one of the oldest natural ingredients whose beneficial effects on the skin are known from ancient history. 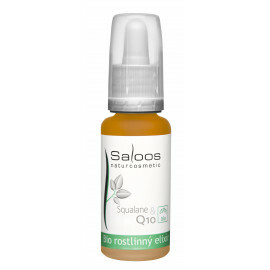 Squalane is so-called "dry oil". Due to its structure, it is very easy to absorb quickly. At the same time, it acts as an antioxidant that helps protect the skin against the adverse environmental effects. Leaves the skin velvety smooth and brighter without greaseiness. Effectively locks moisture into the skin, adds moisture and helps improve its natural appearance. Increases the elasticity of the skin and helps to reduce the appearance of wrinkles. Very fine 100% natural clay ideal for cleansing skin, body and hair. Suitable for all skin types including problematic. It excels in its ability to absorb excess sebum, toxins and dirt from the skin. It helps prevent widespread pores and black dots. Removes dead skin and dirt. It improves skin elasticity and vitality, brightens it and leaves it moisturized, soft and supple.